Loved Jurassic World + Now What? Jurassic World was fantastic, right? I thought it was going to be great, and it turned out to be even better. If you’re like me, you enjoyed the movie so much that you don’t want the dino-fun to end. So… now what? Here are 5 ways that you can keep the Jurassic-excitement going. If your knowledge of Jurassic-stuff only goes so far as the movies, you should read the books. Without giving anything away, let me advertise for the books by saying that they get into more of the philosophical and scientific elements of the movies (which are some of the coolest parts anyway, if you ask me), and they let you experience the parks in a more direct way than you do when you watch the movies. As previous discussed on this blog in an article titled 5 Reasons Jurassic Park is probably the Best Movie Ever, there is a neat area of Universal Studios in Orlando called Camp Jurassic in their Islands of Adventure area. This is an area where you can explore a Jurassic themed area on your own. There’s a dark, dubious cave, a net area to climb around (pictured on the right), a place to have a water fight, and other fun areas to explore. When I was there, this area was surprisingly empty, and I get the sense that not many people know about it – probably because it’s overshadowed by the nearby Jurassic Park visitor’s center and main ride. So if you’re in the area, check this out for the dinosaur-fun, and because it’s simply one of the best parts of this theme park. The game LEGO Jurassic World was released on June 12th, and contains major events from all of the movies. Versions of the game are available on Xbox One and Xbox 360, Playstation 3 and 4, Windows PC, Wii U, Playstation Vita, and Nintendo 3DS. What did you think about Jurassic World? Once you’ve read the books, tell me: what did you think about them? Did you like the ways that they were different from the movies? Did you think the movies should have stayed truer to the books? Did you know that Michael Crichton was a movie director? And did you know that he made a movie with a very similar concept to Jurassic Park 20 years before Jurassic Park was released in theaters? I was surprised, too! The movie is called Westworld. The overall idea of Westworld is that you have visitors visiting a theme park that has three areas (Westworld with a western theme, Romanworld with a Roman theme, Medievalworld with a, you guessed it, Medieval theme). The worlds are populated mostly by robots. Visitors are free to do whatever they want in these areas, and that everything is safe and that nothing can actually harm them. But the robots go crazy and start attacking the guests (sound familiar), and it’s up to the movie’s star to make it out alive. The film is from the 70’s, so you might be able to find it in a thrift store. If not, it’s available for rent and purchase from outlets such as iTunes and Amazon. Whether you decide to spend some time reading, exploring, gaming, commenting, or checking out a similar movie, you now have some ways that you can keep the fun from the theatre going long beyond the end of the credits. Hey, have you ever heard about this hot, new book called Ender’s Game? I’m currently reading Ender’s Game for the first time. If you’ve never read it, I highly recommend it (so far); if you have read it, you may be saying ’bout time – what took you so long. Remember, I haven’t always being okay with science fiction or nerdy stuff (being okay with liking what you like was discussed in the post Whoever You Are, Accept Yourself*). So, having recently re-read Jurassic Park (Jurassic Park is discussed in the very funny post Top 5 Reasons Jurassic Park is Probably the Best Movie Ever), my wife, without hesitation, handed me Ender’s Game, a popular book on her side of the family, and said I should read it. I really like it. It is science fiction, sure, but it doesn’t feel like it. It’s character centered, so even though there are lazer battles, that’s not the be-all and end-all. And, spoiler alert, they’ve talked a lot about buggers (where I am in the book), but I haven’t actually seen one. So, I’m looking forward to that, and to finding out where Card is going to end the book. With a war? With the siblings back together? With Ender in a hugely significant leadership position? With an infuriating cliff-hanger? Only time will tell! So, let me get this straight… Ender is the runt of the litter, plays video games all the time, is fantastic at lazer tag (and well respected because of it), and is best friends with his sister. Talk about nerd fantasy! Stay tuned for a reaction-to-the-book post as soon as I get it finished! Have you read Ender’s Game? What do you think about it? Have you seen the preview for the new Teenage Mutant Ninja Turtles movie? If not, click here to watch it. So, what do you think? Are you excited? Are you a little… conflicted? Tell me your response to the trailer in the comments. If you are a bit conflicted, you’re not the only one. I grew up watching the Ninja Turtles in their movies, and their cartoons. I always thought of them as fun and their shows as having a lot of action, but that at the end of the day, I would like to give them a big hug and have a slice of their super-cheesy pizza (hey, I was four. That’s about all you need at that point!) So when I saw their monstrous appearance in the new movie trailer, it threw me. The scary appearance of the turtles and the rumors that their origin story might involve them being aliens have my eyebrows raised so high in disbelief that they’re about to leave my head. But have I washed my hands of the movie? No way! In fact, I’m super excited for the new movie and can’t believe that they released the trailer to get me (that’s right, I’m taking personally) so psyched when the movie won’t be released until August eighth of this year). But why be so excited? I can’t explain it. I don’t instantly like the way they look, but I want to so bad that I think I’m tricking myself into liking it. How’s that for being a fan?! Looks and potentially un-awesome origin story aside, the characters still seem to be… themselves. Michelangelo was being a funny, Donatello had some tech stuff going on (which you can see on is shell for all of a split second) and Leonardo is obviously the big man (or… turtle) in charge. It showed Raphael for an instant, too. Being thrown into a large car. And that’s about all we see of him. I guess his character was always that of the cranky guy. Maybe he’ll be cranky in this movie because he was… thrown into a big car. So, what do you think? Are you super excited for the movie? Are you displeased with the direction it seems to be going in? Remember Lost? That TV show from the early 2000s? The one that had a fantastic first episode that made everyone think the series would be equally amazing? Remember how everything… went wrong? What started out as a survival show with spooky, supernatural shenanigans and an overarching mystery quickly devolved to story lines about rival tribes, corporate conspiracies, and, most unforgivable of all… time travel. But super-dedicated audience members stuck with the series, believing that everything would lead to a finale that would tie all of the story-strands together. And there were lots of them. Though I did enjoy the finale, the ending that so many hoped for, the one that would answer all of the questions, never came. I mean, the finale left SO MANY things left unsolved. There’s no way to know exactly, of course. But I suspect it had something to do with writers. I wouldn’t be surprised if the people who were behind all of the different twists and turns couldn’t make up their mind about the type of story they wanted to write. One week it involved religion. Another survivalism. Another revenge. And the list goes on. I figure that was pretty awesome from a writer’s standpoint. But from the perspective of someone in the audience? Confusing, random, and what felt like tease after tease. I have heard that to give an audience a satisfying ending, you have to go back to the beginning. And Lost did that. The very first image of the first episode was Jack on the ground, opening his eyes. The last? Jack on the ground, closing his eyes. That was cool, and I really appreciated it. But what about the rest of the first episode? The first few episodes, for that matter? I think the series, as a whole, could have stuck to the story elements and the genre of the first few episodes (mystery, survival, characters interacting with each other, and spooky stuff with Jack seeing his father in the woods) throughout the entire series. I don’t think Jack and the gang should have ever found anyone else living on the island. I don’t think there should have ever been anything about time travel, nuclear bombs, or actually making it off the island (unless that’s how the series ended). Even though I enjoyed the Lost finale, there were plenty of times during the series when I thought that it had become silly and that it was nowhere near as fun as it was during those first few episodes. And that’s a shame, because they could have stuck to the mystery, stuck to the spooky stuff, and stuck to character development. That way, everything that happened between Jack opening and closing his eyes would have been a lot more satisfying. Were you / are you a big fan of Lost? Sam, I was glad to receive your question – having just been considering this myself. Good thing I have an answer for you! It turns out that when you are on a road trip, and it feels like it is taking forever for you to reach your final destination, it’s because… it actually does take forever. When you jump onto the highway / interstate, your car actually merges into another dimension. In that dimension there is only a long line or a road, if you will, with no beginning and no end. Many believe that this ‘road’ is part of some sort of government research project that has gone wrong, because it cannot be removed from our world. So, instead of acknowledging that there is a problem, we are encouraged to use it to… move about the country. When you get on the highway / interstate, part of you joins with this never-ending line. Forever. There is no way to leave it. Ever. Now, you may say, but I was on it the other day, and I got off just fine. To you I say: sure you did. Sure you got off, but did… all of you? Now, just hear me out. Part of you did get off the highway / interstate. But part of you didn’t. And it never will. But that can’t possibly be real! you may exclaim. It doesn’t sound reasonable, but when you think of it, there can be no other explanation. Think about it like this: even after leaving the road, don’t you feel exhausted? This is because part of you is still on the highway / interstate dimension. And it always will be. Therefore road trips feel like theytake forever because… they do. The latest fun, spooky episode of The Josh Greesonbach Show is now available here! Is Life Like a Video Game? As a guy who spent way too much of his youth with either a Nintendo 64 or a Playstation controller in his hand, I can’t help but ask: is real life like a video game? Let’s begin our discussion with the topic of challenges. The challenges people face in real life can seem very similar to the challenges that they do in video games. For example, sometimes all I want to do is relax and spend time with my wife, but I have a number of seemingly random tasks to complete first. The way that I have to do all of these things first before I can do what I really want makes me think of all those times when all I wanted to do was save the princess, but no, I needed to find a bagillion red coins or stars, or I had to make my way through some sort of terrifying forest first. And what about leveling up and how the concept that one must improve over time in order to take on bigger challenges further down the road? In games, we level up by earning points, but in real life we do it through education, training, exercise, food, socializing, and experiences. And when it comes to rewards, there are game/real life similarities too. In games, rewards come in the form of new levels, new characters, and points. In real life, we reward ourselves with rest and time spent with friends and family, and also acquiring things we want and trips to places we want to go. All of this makes me think that there’s something philosophical about games. The most meaningful games tap into many of the challenges that come with being a living human being. I doubt video game makers spend a lot of time considering their craft from this perspective, but I think there’s a case to be made. And I just made it. The take home message: In video games, just like in real life, the adventure can become a bit tedious. You can even start to wonder whether or not the journey is worth the struggle. But keep in mind why you started the adventure, and remember that all of this: the good times, the tough times, and the triumphs will lead us to an ending that is absolutely worth it! How do you like to level up in your real-life video game? 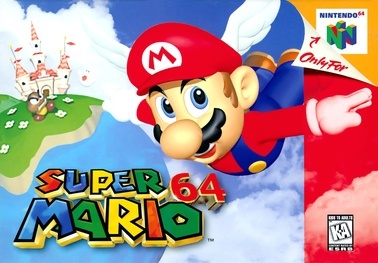 If you’re somewhere between 25 and 33, and are at all a fan of video games, I bet you vividly remember the first time you laid your eyes on Super Mario 64. The game was beautiful, smooth-looking, immersive, challenging, and a heck of a good time. Whether you were in one of the painting worlds, looking for that next juicy gold star to make Mario celebrate, or exploring one of the castles many, many rooms and corridors, or taking Bowser on to free the princess, this game was hours … and days … and months… and years of fun. What’s your favorite Super Mario 64 memory?